Stop number 18 is Manyo Bridge. To be more specific, the middle of the bridge. This is one of the 2 main bridges over the Chikuma River here in the heart of our onsen town, Togura-Kamiyamada. Imagine a few geisha ladies standing on the bridge. Actually, imagine a lot of geisha ladies standing on the bridge. 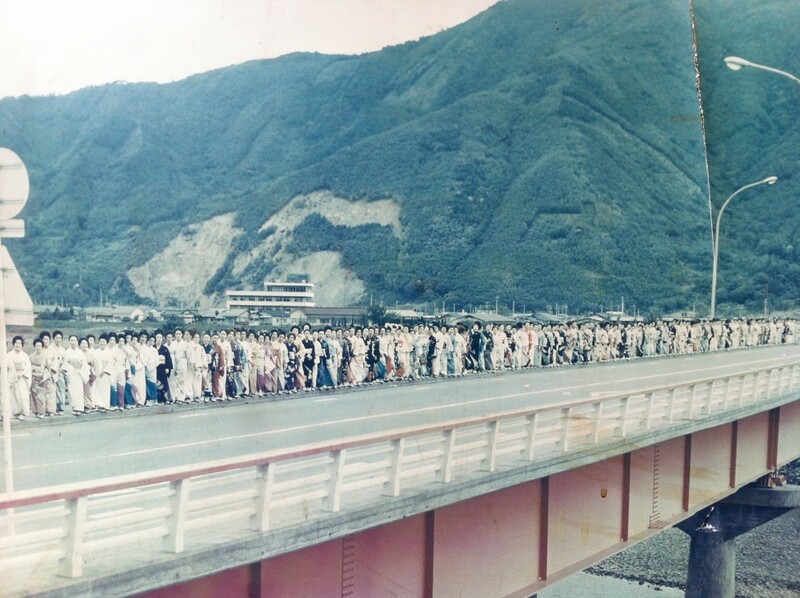 Back in this town’s heydays, in the 1970s and 80s, there were actually so many geisha in this town, that at one point, for a special commemorative picture, they all lined up from one end of the bridge to the other, and they spanned the entire bridge. That’s how many geisha were at this Togura-Kamiyamada Onsen back at its peak. Nowadays, there are only about a dozen or so geisha, and they are definitely getting up in age, but we are still very proud of our geisha heritage. When there’s a big banquet, a lot of people will call in the geisha to help provide the entertainment and the conversation and to pour drinks. Another option is a 30-minute geisha show. If you have a small group for a meal at one of the local inns, you can have the ryokan arrange for two geisha to come, a shamisen player and a ‘tachikata’ dancer. They will peform a couple of dances, they will teach the guests how to do one of the dances and everyone will join in a circle and dance to the shamisen, and at the end you play a parlor game called Konpira-funafuna which is basically a drinking game. It’s pretty much impossible to beat the geisha. When you lose, you have to drink a beer. It’s a lot of fun, so if you come to Japan and are hoping to experience a little bit of what the geisha world is like, then Togura-Kamiyamada is the perfect place to do that.